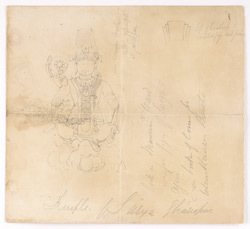 Pencil drawing by Frederick Charles Maisey of a sculpture from the temple of Surya at Gyaraspur, with notes, dated 1845-1852. This drawing depicts a figure of Aditya, a sun deity, from the Bajra Math Temple which is assigned to the 10th century AD. Bajra Math, situated in the outskirts of Gyaraspur, is a triple shrined complex consisting of a central shrine dedicated to Surya, flanked on either sides by shrines dedicated to Shiva and Balarama. The central shrine has a curvilinear tower while the flanking shrines have tiered pyramidal roofs. The external walls are decorated with registers of sculpured figures. The shrines had a common manadapa or hall and a rangamandapa, an open pillared hall. The central shrine doorway has an elaborately carved doorway with representations of the Adityas, solar door-guardians, the river goddesses as well as lotus creepers, animals, birds and various semi-divine beings.